*Note – some parts of this discussion were previously published in the Stroke article. Chinese Traditional Medicine (TCM) goes back to 2000 BC in its current form, and in its antiquity goes back at least 5,300 years! It’s based on energy movement throughout the body along specific paths or “channels.” Acupuncture works by manipulating energy at points where that energy flows near the surface. There are about 1000 distinct points all over the body, each with their own unique qualities. I came to acupuncture as a profession when it was the only thing that could stop my back pain after a severe car accident (I’m now completely recovered). When I first started studying I was a little skeptical – I was a hard-core scientist and figured the map of channels was an elaborate way to memorize nerves and other anatomical landmarks. The more I studied, though, the more I came to see that this is a completely different system of physiology. After years of seeing the power of this odd system at work – on skeptical humans, on animals, on “impossible cases” – my current belief is that this is a form of energy we just can’t explain yet. If you told a 16th century doctor that you could see inside the human body without cutting it, you would be declared a witch. Now, any x-ray or ultrasound technician has that ability. NIH has been funding research into measuring energy flow along the channels. It’s only a matter of time before TCM becomes part of our accepted science of medicine. We’ve all heard of Yin and Yang (pronounced to rhyme with Pin and Pong, by the way). They are tossed around in popular culture a lot, generally with a superficial understanding of them as two sides of a whole. I’ve even seen them likened to Superman and Clark Kent! In Chinese medicine, however, they have a very specific meaning. Think of Yin as being the moist, nourishing, quiet, still, internal, “feminine” aspect of your being. Yang is the other side of the coin: It’s the loud, bright, moving, motivating,expanding, “masculine” side of you. See how the white Yang is rising, while the black Yin is descending? Note also that each contains a bit of the other: They are incomplete without the other half of the pair. There is a delicate balancing act between the two types of energies, and they influence each other. 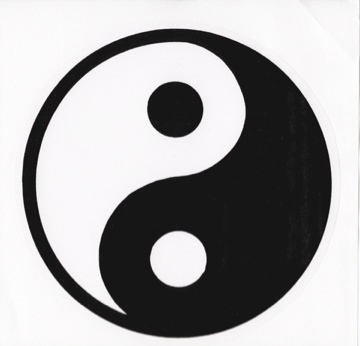 When Yin and Yang separate (in a raging fever, for example) the patient will die. Yin/Yang: Each contains and is dependent on the other to create a whole. Think of an animal, or a baby crawling on all fours. As applied to anatomy, the front and lower parts of the body are Yin. The back and upper body are considered more Yang. On the limbs, inside surfaces are Yin and the outside aspects are Yang. Acupuncture treatments must be planned out so they contribute to balance. For example, if someone has a headache, we don’t just use local needles on the scalp. We use points on the hands and feet to distribute the input to the body. There’s a great point on the sole of the foot that will draw excess energy down, which helps a lot with Yang-rising types of headache. Yin and Yang energies must work together, and should give and take throughout the day. Yin predominates at night, while Yang rules the day. Some hormonally based examples may be helpful: A woman going through menopause is Yin deficient. Her Yang, no longer held in check by her Yin, causes hot flashes, night sweats, and dryness of the skin and other bodily fluids. To ease this “change of life,” we start by using acupuncture points to clear excess heat (the symptoms). Other points act to nourish the Yin (the cause). These treatments are surprisingly powerful for stopping hot flashes. Likewise, a man as he ages will suffer from Yang deficiency. This is readily identified in the case of erectile dysfunction and decreased libido. Other symptoms can include lower back pain and a general loss of vigor. 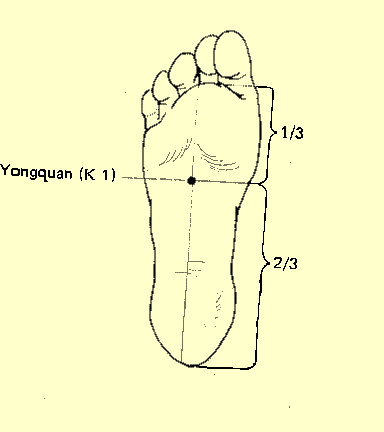 In this case, we use acupuncture points that activate the Yang. Some acupuncturists use moxabustion (burning mugwort, an herb in the sage family) to warm and stimulate the Yang, although most modern clinics (mine included) are now using infrared heatlamps. Using modern technology eliminates the chance of burns and makes for a wonderfully relaxing session. Most patients feel some immediate relief when acupuncture is used to balance Yin and Yang, but longer term hormonal changes will require multiple treatments. This is a simplified explanation, of course. 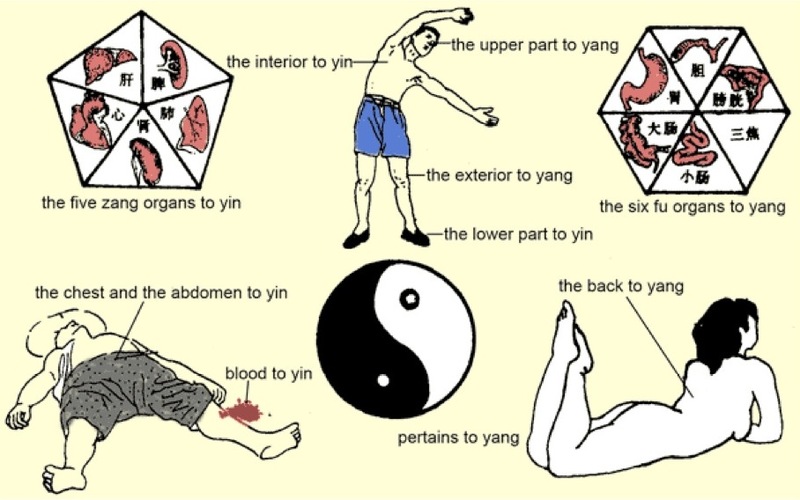 Masters of Chinese medicine study for years to understand the subtle interplay of Yin, Yang, and the channels. It’s a fascinating tradition with a lot to teach us about the human body. Mingmen, the Gate of Life (AKA Du-4) is located in the center of the spine, just below the 2nd lumbar vertebrae. It’s used for building Yang, treating infertility or sexual issues such as erectile dysfunction, and for lower back pain or weakness. 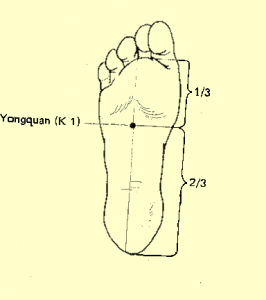 Be careful stimulating this point if you are using acupressure, since it’s often tender. Applying heat can be useful, especially If you tend to be cold. In my clinic, of course, I use acupuncture and an infrared therapy lamp. At home, you can direct a warm shower stream onto it or use a microwavable rice bag (I have them at the office if you need one). Also good for lower back pain: LV-3, BL-40 and GB-34. 2012 was a great year for many reasons. I’ve seen some stupendous changes happening in my regular patients (I can’t name names, obviously, but I’m incredibly proud of all your hard work!) and it warms me up to think I might have had something to do with that. We’re making babies, running marathons, and swapping bad habits for good ones. We’re cooking more, smoking less, and generally being happier. It’s a beautiful thing. I love my job, and I thank you all for letting me continue to do it! By the way – there are still a few spots left for the Feb 9th Easy Advanced Bodywork Class. It runs 10am-1pm here at the clinic – a three hour hands-on seminar on medical massage techniques that require no previous experience. $60 per person, limited to 8. More info here. Have a glorious 2013 – I certainly plan to do so!